ATHENS, Mar 14 2012 (IPS) - Last January, several pupils coming out of a high school in Kallithea, a central residential neigbourhood in Athens, attacked a Pakistani passer-by. The nature of the assault alarmed Maria Daneil and Artemis Kalofuri, as well as other teachers in schools around the area, who consider this to be just the latest in a sequence of racially charged confrontations in Greece’s economically fraught urban areas. “There has been a deteriorating picture including anti-migrant attacks, the attack on a makeshift mosque, harassment of students, as well as the appearance of people flaunting neo-Nazi paraphernalia around the schools. We felt that passive observation is not effective anymore, we had to do something,” Kalofuri told IPS. With support from the local branch of the association of teachers (ELME), the educators formed a student discussion group, where questions on migration, racism and fascism, as well as current social issues arising from those problems, could be raised and analysed by pupils themselves. All major political parties will play the migration card in their campaigns during the run-up to the elections, slated to be held at the end of April or early May. Many pre-election polls illustrate a polarised electorate that is going to bring into the parliament many minor radical parties, including the notorious national socialist organisation Golden Dawn. Leader of the right wing New Democracy party, Antonis Samaras and founder of the right wing extremist LAOS party, George Karatzaferis, both current members of parliament, have already made openly xenophobic remarks in order to limit the defection of their voters towards the even more radical right wing. In a recent speech to the parliament, Karatzaferis called for illegal migrants to be sent to camps where they will work for food. Samaras accused a failed citizenship law – designed to facilitate the normalisation of second generation citizens - that has been stalling in the high court for years, for attracting hundreds of thousand of illegal migrants to Greece. The fact that only 2,500 migrants have been granted Greek citizenship since the law appeared, the vast majority of them ethnic Greeks from other countries, invalidates this claim. Daneil believes the attack is further complicated by the fact that the assailants were mostly second- generation migrants themselves. Both teachers mentioned links between a very small number of pupils and radical nationalist groups as well as the establishment of a culture of fear and silence regarding the issue. Fear, particularly, is what Yunus Mohammedi, an Afghan immigrant residing in Greece for over ten years, has begun to notice in the city, as public aggression has almost become a daily issue. In order to alert fellow Afghan immigrants, Mohammedi circulated a map of Athens, marking in red the zones where most violent incidents take place. “This is how we used to warn people about the places they ought to avoid in Afghanistan when I worked there for Doctors Without Borders,” he recalled to IPS. A trained pathologist and one of the few Afghans that speaks fluent Greek, Mohammedi has become a person with whom many Afghans consult when they are in trouble. “Ten years ago things were very different. Back then you had to worry about having a job and making ends meet. Now it is dangerous, we often have to care for people stabbed or violently beaten. I often receive phone calls from people threatening me for getting involved,” he said. The economic crisis has altered significantly the social rules between Greeks and immigrants and asylum seekers, mostly from Asia and Africa. Since 2005 Greece has become the main influx point for undocumented migrants, with more than 80 percent entering Europe coming from Turkey through the Aegean Sea or the Northeast mainland boundary of the river Evros. The vast majority of these migrants hope to move towards Northern Europe. However, clauses in the Dublin II regulations that dictate the returns of irregular immigrants to the country they entered have effectively condemned scores of immigrants to remain stuck in limbo in Greece. This has transformed the country, and Athens in particular, into a depot of hundreds of thousand of irregular immigrants and asylum seekers, who survive on below-subsistence incomes won in a vast black market. 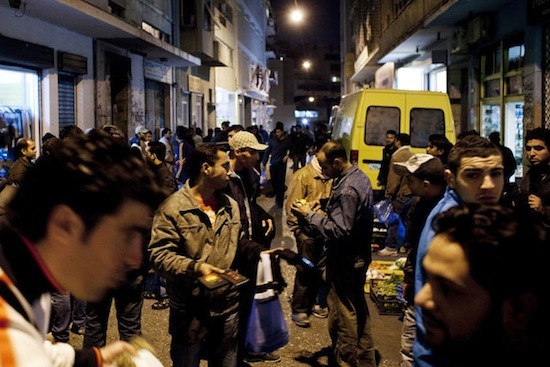 Certain areas of the capital have been morphing slowly into semi-permanent migrant quarters with the municipality estimating that in certain central areas, Greeks number less than four percent of the population. Since 2008, the worsening economic crisis replaced most Greek’s passive understanding of migrant workers’ plights with xenophobic intolerance. According to Eurostat, Greece’s economy is retracting at the alarming rate of 7.5 percent, while unemployment climbed to 21 percent last December. Moreover, increasing involvement of migrants in violent thefts and organised criminal activity has inflated antipathies. Greek police have registered an increase in the involvement of migrants in violent crime rates from 24 -25 percent in 2000 to over 65 percent today. Lack of employment in the regular and irregular markets has increased antagonisms not only between Greeks and foreigners but also between various migrant groups. Far-right groups have capitalised on this situation to increase their popularity and recruit membership around the run-down areas of the city, leading to an explosion of anti-migrant rhetoric and violent attacks against Asian and African migrants. Tzeferaku as well as Mohammedi have alleged that Greek police personnel are systematically discouraging migrants from reporting violent incidents. Judith Sunderland, a senior researcher at Human Rights Watch, added that a recently completed fact- finding mission in Athens supported fears of a brewing crisis. “The testimonies we have collected so far from victims and associations providing services to migrants and asylum seekers suggest that the violence has increased significantly over the last several years,” Sunderland told IPS. Greek police spokesman Athanasios Kokkalakis, who has opposed these allegations, told IPS, “Whenever the Greek police has received a detailed report about incidents related to racially motivated violence it has intervened and arrested anyone responsible, even in cases where the accused have been police officers themselves,” he stressed. The combination of a relentless migration wave and the deteriorating economic crisis fuelled by austerity measures is giving birth to complicated social issues says, Kokkalakis added. Last week the United Nations High Commission for Refugees (UNHCR) completed a three-month-long pilot project of documenting xenophobic aggression. After the results are examined the agency will try to put in place a permanent observatory of racial and anti-migrant violence.